Roulette Game Terms is the third and last part of roulette gamerisms. This international game is classified as one of several casino number games. Some of the unique roulette game terms found here include Plain, Rien Ne Vas Plus, Signature, Square Bets and Voisins Du Zero. Odd-Number Bet: wagering that an odd number will hit on the next spin. Outside Bet: placed on even money or 2 to 1 bets on the outside of the roulette table layout that include red, black, odd, even, high or low. Opposite of inside bet. Pair: French term for even bet that is betting that an even number will hit on the next spin. Parlay: game strategy of doubling the bet after a win. Passé: French for high bet, wagering on upper 18 numbers=19-36. Pays 1 to 1. Past Posting: dishonestly adding more chips to a bet that has already won, also known as capping a bet. Premiere: French term for first, wagering the first group of 12 numbers in the dozen bet. Quarter Bet: betting on four numbers at once that pays 8 to 1 for a win. Alternate terms are square bet or corner bet. Quatre: French term for a 4 number bet. Red Bet: bet placed that the next winning number will be red. Win pays 1 to 1. Also known as a red color bet. Red-Black Bet: on 18 red numbers or 18 black numbers at once. Pays 1 to 1. Rien Ne Vas Plus: French term for No more Bets. Rouge: French term for a red number. Row Bet: betting on three numbers at once that pays 11 to 1 for a win. Bets are placed on the outside line of the row of three numbers across the layout. Alternate terms are street bet or three number bet. Signature: theory that certain croupiers can spin the roulette ball into a specific area/ number based on their hand movement from a previous hit. 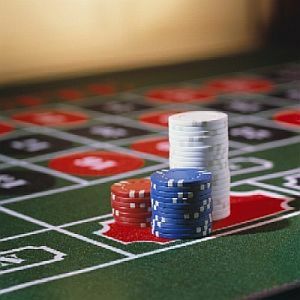 The theory states that a croupier can develop a ‘signature’ spin of the roulette ball resulting in an opportunity for players to determine the next winning number. Single Number Bet: wagering on one number only placed directly on the number and should not touch any line. Pays 35 to 1. Single-Zero Wheel: a single zero (0) and a number sequence as follows, clockwise starting with 0: 0, 32, 15, 19, 4, 21, 2, 25, 17, 34, 6, 27, 13, 36, 11, 30, 8, 23, 10, 5, 24, 16, 33, 1, 20, 14, 31, 9, 22, 18, 29, 7, 28, 12, 35, 3, 26. Six Number Bet: betting on six numbers in two rows or ‘streets’ picked on the table layout. Win of one of these numbers pays 5 to 1. See line bet. Sixaine:French term for a six-number or line bet, wagering on six numbers in two rows or ‘streets’. Spin: of the roulette ball to determine a winning number after all bets are placed. Split Bet: betting on two numbers at once. An inside bet. Square Bets: wagering on four numbers at once. Pays 8 to 1. Alternate terms are corner bet or a quarter bet. Stack: group of 20 roulette chips. Allows for rapid counting by casino employees. Straight Bet: betting on a single number. Place your bet inside a number on the green. Make certain no chip crosses any of the lines. Pays 35-1. Straight Up Bet: same as straight bet. Betting on a single number. Place your bet inside a number on the green. Pays 35-1. Street Bet: betting on three numbers at once that pays 11 to 1 for a win. Bets are placed on the outside line of the row of three numbers across the layout. Alternate terms are three number bet or row bet. Three Number Bet: betting on three numbers at once that pays 11 to 1 for a win. Bets are placed on the outside line of the row of three numbers across the layout. Alternate terms are Street Bet or Row Bet. Tiers du Cylindre: betting on numbers groups that are paired neighbors on the table layout. Transversale Simple: French term for a three number or street bet, wagering on three numbers in one row or ‘street’ at once. Pays 11 to 1. Trio Bet: wagering on three numbers in one row or ‘street’ at once. Pays 11 to 1. Triple: French term for a three number or street bet-- betting on three numbers in one row or ‘street’ at once. Pays 11 to 1. Twelve Number Bet: bet for one of the 3 columns consisting of 12 numbers on the roulette table layout. Bets are placed at the bottom of vertical column and a win pays 2 to 1. Alternate term is column bet. Two Number Bet: betting on two numbers at once. An inside bet. Alternate term is split bet. Visual Wheel Tracking: game strategy that attempts to determine where the roulette ball will land. Voisins du Zero: French term for wagering on a group of numbers at a specific section of the wheel next to the zero. Wheel: short form term for the roulette wheel. Wheel Chips: specially designed chips for the game of roulette. Wheel Head: section of the wheel holding the numbered pockets. Wheel Roller: term for a roulette croupier. Zero: number, green in color, on the roulette table layout. 1) What is the house edge on single-number bets? A. Higher than on even-money bets such as red/black or even/odd. 1) C. Same as on even-money bets such as red/black or even/odd. This is Part 3 of 3 for Roulette Glossary.